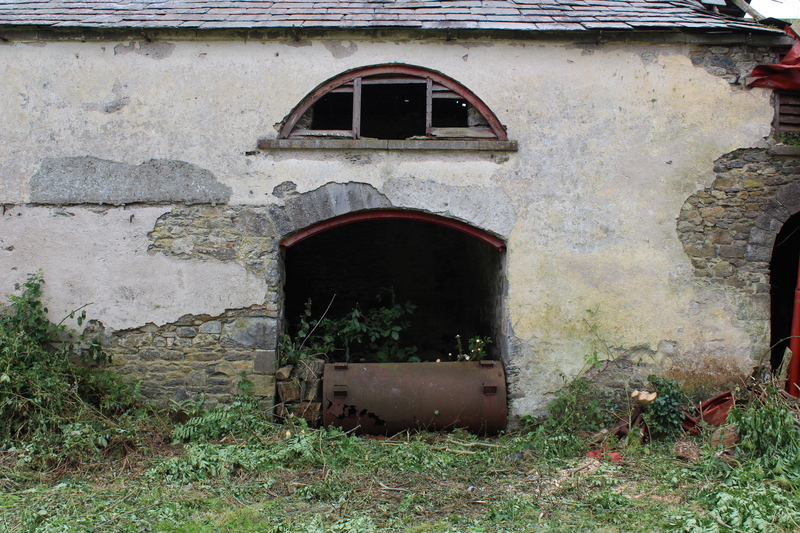 Located on a rise in the woods at Meares Court, County Westmeath stands the remains of – what? Most of the buildings on the estate date from c.1760, although the core of the main residence incorporates a much older tower house. This structure is presumably later, its interior accessed via an arched door leading into a space lit by a pair of similarly substantial arched windows that offer views over the landscape. The remains of a summer house perhaps? Although a religious house was established on the Hill of Slane, the present remains date from a later foundation created for the Franciscan order by the Flemings, a prominent Norman family, members of which were Barons Slane from 1370 until the death of the last of the direct line some four centuries later. Like many others, the Flemings remained loyal to the Roman Catholic faith and suffered the consequences: Christopher, twenty-second Lord Slane was attainted in 1691 owing to his support of James II and subsequently moved to mainland Europe. He was eventually reconciled to the British government and in 1713 Queen Anne created him first Viscount Longford, but since no letters patent were issued before her death a year later the title had no validity (in any case, he in turn died without male heirs in 1726). Meanwhile the Franciscans saw their friary closed in the 16th century but then temporarily restored to them by the Flemings. Members of the Capuchin order also took up residence here at one stage but the site seems to have been abandoned for good in 1723, after which it fell into ruin. What can be seen today on the Hill of Slane is primarily a rebuilding of the friary undertaken for the Franciscans in 1512 by Christopher Fleming, fourteenth Lord Slane. It is divided into two sections: the church and the college. The former is surrounded by a walled graveyard and its most striking feature is the tower at the west end of the building. This rises some sixty-two feet and incorporates a fine 15th century Gothic window above the doorcase. Relatively little remains of the main body of the church. The adjacent college buildings were intended to house four priests, four lay brothers and four choristers, with three ranges grouped around a central courtyard and the fourth side to the west closed by a curtain wall. A spiral staircase in one corner provides access to the upper levels, the views from which explain why this location was always likely to be of significance; from here it is possible to scan the surrounding countryside for several miles to south and east. Nearby are the remains of a motte and bailey believed to have been constructed by the Flemings before they moved their residence to a lower site which is the present Slane Castle. When my mother was matron of those relishing victuals. The table was loaded with the brightest of tin. And the quaint stone chimney, how it would smoke! From That Old Kitchen Stove by David Harold Judd (1901). Pictures of the former gate lodge at Magheramenagh Castle, County Fermanagh. One of the best-known views of Curraghmore, County Waterford is the façade of the house, the top of which is adorned with the stag of St Hubert, a crucifix between its antlers. This figure is taken from the family crest of the de la Poers who are believed to have first come to Ireland along with other Norman settlers in the 12th century. Here is a photograph taken on the roof of the building and showing the other side of the stag. At some date a metal bar was inserted into the animals’s neck to prevent the head falling off. Meanwhile, Curraghmore’s garden front is likewise topped by a beast, in this instance a dragon with a broken spear through its neck. This comes from the Beresford crest: in 1717 Sir Marcus Beresford married Lady Catherine de la Poer, only child of James, third Earl of Tyrone. Again, repairs have been carried out to the work. Both the stag and dragon were made by Viennese-born sculptor Joseph Edgar Boehm, a favourite of the British royal family: he carved several statues of Queen Victoria and her daughter Princess Louise was one of his pupils (indeed he died in her house in London in 1890). Conveniently the back of the dragon carries the date 1st November 1872, presumably referring to when it was made rather than installed on Curraghmore’s roofline. In 1809 in an effort to put a stop to marine-based smuggling the British government – then at war with Napoleonic France – established a body called the Preventive Water Guard (otherwise known as the Preventive Boat Service). Operating across these islands, the Waterguard was the sea-based arm of revenue enforcement, its members based in Watch Houses around the coast of Britain and Ireland, with boat crews patrolling the waters at night. While they were primarily concerned with bringing smuggling to an end, they also gave assistance to shipwrecks and indeed kept an eye out for foreign vessels entering national waters. In 1821 a committee of enquiry proposed responsibility for the Preventative Water Guard be transferred from HM Treasury to the Board of Customs. Until then, the Board of Customs and the Board of Excise each had their own long-established preventative forces: shore-based Riding Officers for the former and sea-going Revenue Cruisers for the latter. The committee recommended these services be consolidated and so in January 1822 they were placed under the authority of the Board of Customs and renamed the Coast Guard. The Coast Guard established in 1822 duly inherited existing shore stations and watch houses from the two earlier bodies (as well as a number of coastal vessels) and these provided bases for its operations, with additional properties being constructed as deemed necessary. The first Coast Guard instructions were published in 1829: while still primarily occupied with the prevention of smuggling they also stipulated that when a wreck took place the Coast Guard was responsible for taking all possible action to save lives, taking charge of the vessel and protecting property. By the 1850s, coastal smuggling was no longer so serious a matter and so responsibility for the Coast Guard was transferred from the Board of Customs to the Admiralty. Over the following decades the service began to operate more like a supplementary naval service, although it still was responsible for carrying out rescues and protection of property in the event of a shipwreck. The Coast Guard service was based in stations right around the island, with fifteen of these in County Kerry. The stations were usually built to a standard design. Typically they comprised a terrace of five or six houses set back from the shore but within easy reach of it. There would also be a watch tower and, by the sea, a boat house and slipway. Each terrace included residences for the chief boatman, his men and their families. Inside would be a sitting room and kitchen (plus scullery) on the ground floor, and bedrooms upstairs. As a rule the entrance to each house was to the rear (away from coastal winds) with just windows on the front looking out to sea. These stations survived until the early 1920s when, like other centres such as army and Royal Irish Constabulary barracks, they were attacked and burnt during the War of Independence and ensuing Civil War to ensure they could not be used by the enemy. Many of them, like this example in Ballinskelligs, County Kerry, now stand empty and ruinous, a largely forgotten aspect of the country’s maritime history. Not necessarily one for our American friends: the Ross Monument, County Down. Erected on the shoreline of Carlingford Lough in 1826 to the design of William Vitruvius Morrison, this massive granite obelisk commemorates Major General Robert Ross who had been killed in September 1814 while advancing on Baltimore during the American War. The site was chosen because it was here that Ross and his wife had planned to build a house after his retirement from the army. On the pedestal of the monument if a carved relief in the form of a sarcophagus, featuring emblems of the various countries in which Ross had fought during his military career. Robert Ross was born in Rostrevor, County Down in 1766 and after attending Trinity College Dublin joined the British army, seeing action in successive wars against the French in Egypt, Italy, Spain, Holland and Portugal before being given command of an expeditionary force against the United States. Famously, following the Battle of Bladensburg, he and his troops entered Washington where they burnt many significant buildings, including the White House (which had been designed less than twenty years before by another Irishman, James Hoban). Within a month he was dead, his body subsequently being brought for burial to Halifax, Nova Scotia. As plaques on the other faces of the monument explain, it was erected thanks to subscriptions of more than £2,300 received from his fellow army officers and residents of County Down. In ancient Greek mythology, Erato was the Muse of Lyric or Love Poetry, her name often proposed as deriving from Eros, the God of Sexual Attraction. Here they both are on a wall panel in the ground floor Apollo Room of 85 St Stephen’s Green, Dublin which was decorated by the Ticinese sibling stuccodores Paolo and Filippo Lafranchini in the late 1730s/early 1740s. Like her eight sisters within the same space, the inspiration for Erato’s appearance came from an engraving by Domenico de’ Rossi published in Paolo Alessandro Maffei’s Raccolta di statue antiche e moderne (Rome, 1704). These in turn represented statues formerly in the collection of Queen Christina of Sweden. The Lafranchinis’ version follows de’ Rossi quite closely, although Eros looks to have what might be described as an old head on young shoulders: perhaps that is the consequence of his knowing too much about love. The Irish Aesthete wishes all friends and followers a Happy St Valentine’s Day. Half a century ago, in 1968, the big house at Kilballyowen, County Limerick was demolished. As its then-owner Lt.-Col. Gerald Vigors de Courcy O’Grady – whose family have been based there for hundreds of years – recalled some time later, ‘The huge rooms were too big to live in; it was impossible to live in a house of that nature. If you could live there in warm conditions – yes. It was just a necessity. No I didn’t just want to leave it empty, so there are no remains. I do not like living near ruins; there are too many around here.’ His wife commented that by the late 1960s the house ‘was in a terrifying state of repair and we did not have the money to fix it. We had thought of selling just the house, but then we were afraid we might lose the land as well. It was a great house that had lost its pride.’ There was no support for the owners and no state interest in the preservation of such properties. And so, like very many others, Kilballyowen came down. The surname O’Grady derives from the Irish Ó Grádaigh or Ó Gráda, meaning ‘noble’. The O’Grady family originally lived in East County Clare where they were based in the area around Tuamgraney (where they built a tower house adjacent to what is now the oldest centre of continuous religious worship in Ireland, St Cronan’s which dates from the 10th century). During the Middle Ages various O’Gradys frequently held high positions in the Roman Catholic Church. It helped that clerical celibacy was then not much enforced. Thus in 1332 Eoin (or John) O’Grady became Archbishop of Cashel and, in 1366 his son, also called John, became Archbishop of Tuam. In turn, the latter’s son, another John O’Grady, was made Bishop of Elphin in 1405. At the same time they were frequently at war with other families in the area, not least their distant cousins and former allies, the O’Briens who eventually drove the O’Gradys out of Clare. One of the family, a younger son called Hugh O’Grady had in the early 14th century married a daughter of the head of the O Ciarmhaic family in Knockainy in east Limerick and this would lead their descendants to settle at Kilballyowen. There successive male heirs became the head of the family and were known as The O’Grady. The core of the now-demolished Kilballyowen was a tower house dating from c.1500, around which a house had been built in the first half of the 18th century, and then further extended by a new wing in 1810: in 1837 Samuel Lewis described the property as ‘a handsome modern building in a richly planted demesne.’ The building had a five-bay façade with a two-bay projecting extension to one side: the garden front featured a three-bay breakfront. Nothing of the house remains but the stableyard to the immediate north-west remains. Set around an open court, the four blocks are of almost equal dimensions and contain carriage houses, stalls and accommodation for the employees who would formerly have worked here. Although in poor repair, the buildings still bear testimony to the character of the old house. Had times been different, had it survived even a decade or two longer, might Kilballyowen be standing yet? What happened here also happened right across the country during the 1950s and ‘60s. While better support mechanisms are now in place to provide some assistance, they are relatively modest, thereby leaving much of our stock of historic houses at risk. The story of Kilballyowen, a great house that had lost its pride, is a too-frequent story in Ireland. St Catherine’s, Killoe, County Longford, one of the many C of I churches built in the first decades of the 19th century thanks to assistance from the Board of First Fruits: here, as elsewhere, the present building may have replaced an earlier one on the site. On occasion in use for services (although the graveyard remains active, so to speak) St Catherine’s dates from 1824 and benefitted from a board grant of £900 together with an additional £200 from Willoughby Bond of nearby Farragh. That house had been greatly enlarged for Bond ten years earlier, the architect being Cork-born Abraham Hargrave. Accordingly his son John Hargrave was given the job of designing St Catherine’s. Alas, Farragh is no more (demolished c.1960) and nine years after working in the area poor John Hargrave drowned, along with his entire family, while sailing off the Welsh coast. Without question the most significant domestic dwelling in the village of Killeagh, County Cork – and accordingly, the most neglected. This five-bay, two-storey house dates from c.1770 and, at least on the exterior, still retains many of its original features. But for how much longer? Planting trees and adding street furniture cannot disguise the fact that this is a building at risk of being permanently lost in the near future.